With exactly two weeks to go until Ubisoft unleashes its Stone Age spin on the beloved Far Cry series, the company just released a five-minute, very M for mature “Survival 101” overview that shows off some of the game’s grisly details, like bone-shattering weapons, blood-thirsty animals, cannibalistic tribesmen, and brutal special abilities. Who else can’t wait to wield a double bow and arrow whilst riding a sabertooth?! Fans of recent films like The Revenant and Bone Tomahawk should get a visceral kick out of this video, which shows off a more vicious world than we’ve come to expect in the Far Cry series. Basically, everyone and everything wants to kill and eat you—hopefully in that order. The video introduces us to our hero, Takkar, who seems less approachable than Far Cry 4’s Ajay. 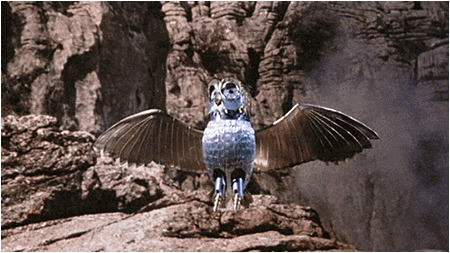 Still, he does have an owl sidekick, who’s less approachable than Clash of the Titans’ Bubo the Mechanical Owl. Takkar has the ability to train other pets like tigers and (flaming?) bears, and must also build up and protect his tribe, the Wenja, from myriad primitive threats. Like the video says, death for man comes swift and often. Now let’s check out that trailer. Far Cry Primal is out February 23 on PlayStation 4 and Xbox One, with the Windows PC version releasing March 1. There’s also a Deluxe Edition that comes in a steelbook case, provides a handy map of Oros, and includes the game’s soundtrack.